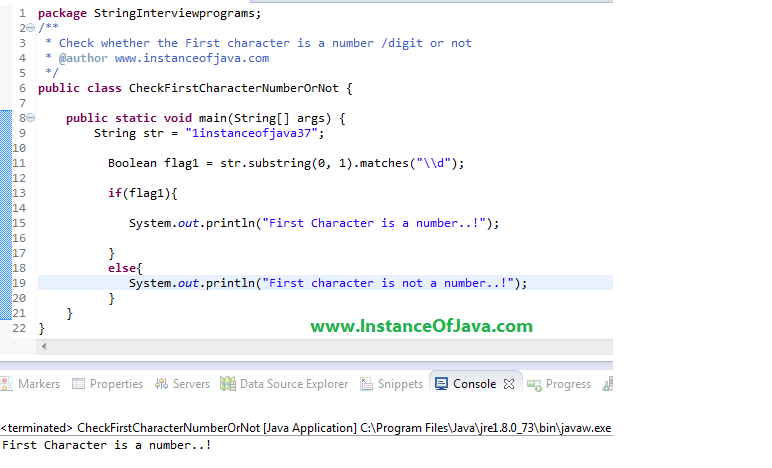 To check if first character of a string is a number or not in java we can check in multiple ways. By using Character.isDigit() method by passing character of string using for loop or substring method. Other way is to check str.substring(0, 1).matches("[0-9]"). Lets see an example program in java to check first character of a string is digit or character. Program #1: Java example program to check the each character of string is number or not character is a letter or number in Java without using regexes? //Check whether the given character is a number /digit or not ? Program #2: Java example program to check the First character of string is number or not by using regex. First character is not a number..! Program #3: Java example program to check the First character of string is number or not using eclipse IDE.